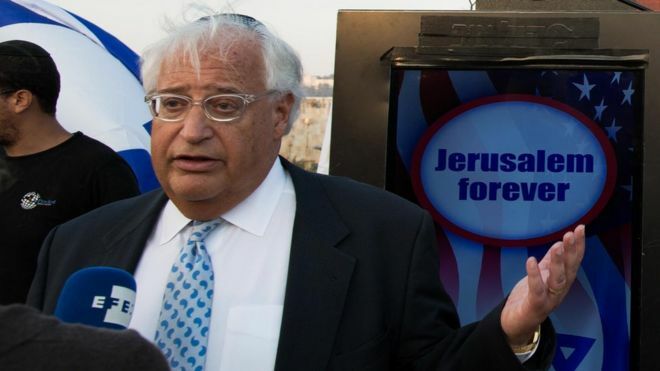 In a very positive sign for Zionism, President-Elect Donald Trump has selected conservative Jew David Friedman as the next U.S. ambassador to Israel. Friedman openly supports continued settlement construction in the West Bank and moving the U.S. embassy to Israel's "eternal capital" - Jerusalem. The selection is a very strong sign that Trump plans to move ahead with moving the embassy to Jerusalem from Tel Aviv once the current six-month waiver ends. The prophetic implications of this are immense. The 57-year-old lawyer is strongly critical of the long-held US goal of a two-state solution to the Israeli-Palestinian conflict. He also supports Jewish settlement building in the occupied West Bank, which the Obama administration considers an "obstacle to peace". A liberal Jewish group opposed his nomination. Conservatives welcomed it. Mr Friedman advised Mr Trump on US-Israel issues during the election campaign. He has made clear his support for Jewish settlements in the West Bank, which he refers to using the biblical names of Judea and Samaria, and East Jerusalem.